As it turns out, the more time you spend stuck in traffic, the more people are on the road to get to jobs or retail and service outlets to spend dispensable income. So the worse traffic gets, the more money we’ll all have to spend, if we can just get to and from work! Therein lies the rub, but it’s good to see forward progress in something besides road and housing projects. Automotive gridlock is usually a sign companies are shipping more goods and hiring more people as consumers spend more money. "While these increases bode well for our economic outlook, we don't expect them to bring a smile to the face of the average commuter," said Bryan Mistele, CEO of INRIX. "Stalled traffic is actually a side effect of a moving economy as people go to work, spend money and businesses respond to demand." Nationally, the INRIX data shows a level of traffic congestion that was dropping incrementally since early in 2011. Now the year to year levels in most cities were up nearly two percent in both December of last and last January. Positive movement in economic indicators was also noted by the latest Thomson Reuters/University of Michigan index of consumer sentiment, showing February's results beating expectations to mark a three-month peak, according to Jianna Smialek of Bloomberg. INRIX arrived at a composite score of 6.4 in January, indicating the average errand took drivers in the 100 most populated cities 6.4 percent longer due to increased traffic congestion. While the economy is clearly improving, the firm cautions it still has a way to go. The INRIX Gridlock Index (IGI) remains far below the level reached in 2010, when U.S. GDP growth bounced back after shrinking for two years, according to a report by the World Bank. While the company’s data shows the economy stabilizing, it still has not recovered all of the ground lost since 2010. Fifty-five of America's 100 largest metropolitan areas measured by IGI show increased traffic congestion during January. Notable standouts in both increasing and decreasing traffic levels are listed below. 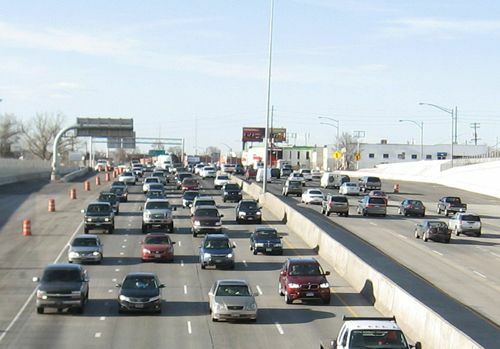 • Utah seems to be booming with Salt Lake City showing 111 percent more congestion behind Ogden with a staggering 200 percent. That’s a lot of traffic congestion, but confirms INRIX analysis with higher levels of income, sales and other tax receipts in the Beehive State, based on a report by Robert Gehrke in the Salt Lake Tribune. • Traffic congestion in Greensboro, NC rose by 192 percent, matching recent job growth and expansion from increased investment by local employers as the state rebounds from the fifth-highest unemployment rate in the nation, as noted by Catherine Carlock in the Greenboro Business Journal. • Meanwhile in Richmond VA congestion rose 86 percent, in a state that could be strongly impacted by federal spending cuts, stated the Pew Center on the States. • Traffic in Louisville KY decreased 61 percent, the biggest decline among the 100 metro areas. • Gridlock in Ohio decreased by 57 percent in Youngstown and by 44 percent in Akron, illuminating the hard road ahead for a state receiving low marks for its level of financial opportunity, according to a scorecard prepared by The Corporation for Enterprise Development. • Up north in Buffalo NY, gridlock lessened by 45 percent, highlighting the challenges in a manufacturing region in decline for three decades, according to the Western New York Regional Economic Development Council. • Surprisingly, gridlock in Fresno CA decreased by 49 percent, highlighting the differences between the state's Central and Silicon Valleys. Based on the INRIX data, residents of Kentucky, Ohio and upstate New York might want to head out to Utah to help build the traffic congestion there. However, here's hope they don’t stop to stay in Colorado, because we have so much gridlock here, it’s questionable whether we could stand much more improvement in our economy.